Τhe owners of Studios Alexandra, warmly welcome all guests to our friendly atmosphere and ofcourse our well known Greek traditional hospitality. Studios Alexandra have been built to cover your family holiday needs by offering modern and convenient comforts that will make you feel right at home. The attentive services , combined with the outstanding location of our unit in the tourist resort of Vrasna Beach, ensure privacy along with an easy access to the beach and the center of the village. The nearby “quaint” villages with the rich natural, cultural and archaeological heritage of the region, make Studios Alexandra the ideal destination for a remarkable, carefree vacation. 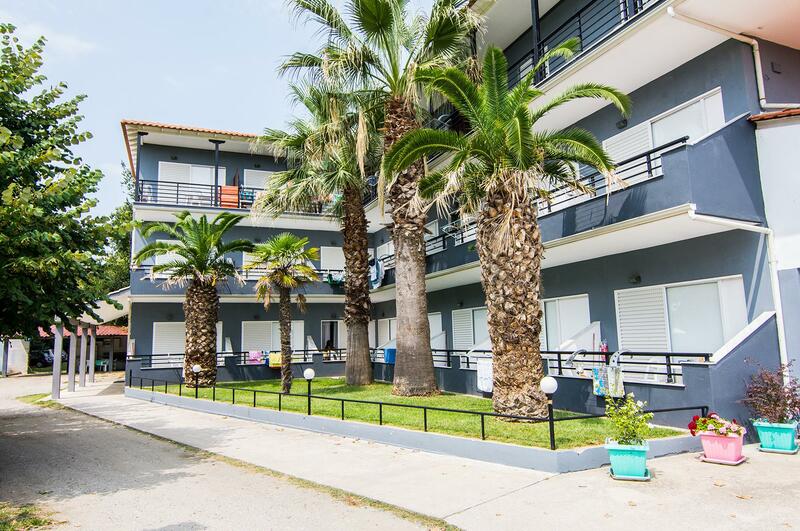 The rooms of Studios Alexandra are well designed, sunny but cool, spacious and functional as well as overlooking the sea and the magnificent large garden that’s breathtaken due to the colours and sweet scents of the flowers and trees. Our unit is surrounded by large common spaces where its guests can be entertained by watching T.V., chatting with other guests, playing board games or surfing in the internet. Two grills are also waiting for you to barbecue and just enjoy yourselves out in nature. For our younger guests we have created a playground with a basketball court and a 5×5 football court, well fenced and safe for lighthearted game, that are always available.